Korean BBQs are known for its DIY affair, where you order piles of meat to barbecue on an open grill at your table, but there are lots of other great dishes you can order that don’t require cooking yourself. It’s also good to have something to consume while you wait for the meat to cook and give you the energy to fight for the meat once it’s done. It always feel like a cowboy shooting showdown where it’s a race to see who will draw the tongs first to grab the meat and who is left behind for the next round of grilled meat. 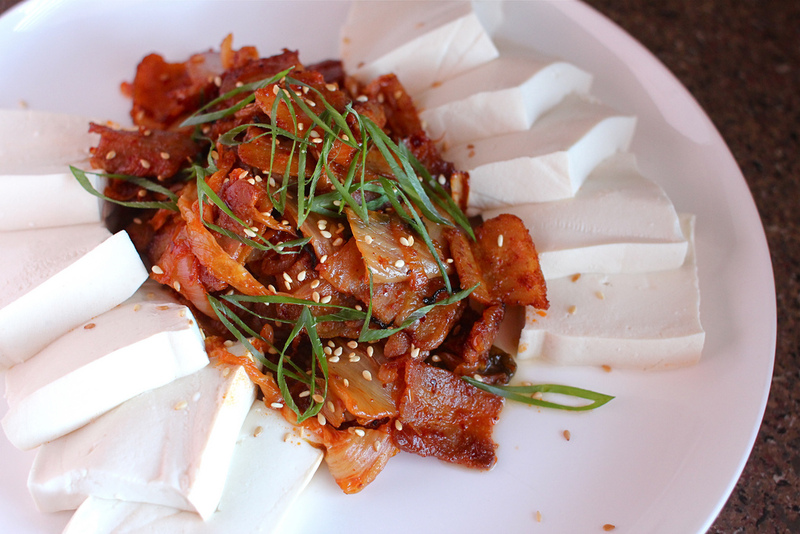 The usual suspects are Korean pancakes, noodles and dumplings but another dish that I am particularly fond of is Dubu Kimchi, which is kimchi stir fried with pork and served with sliced tofu. I first came across this dish at Hwa Ra Korean Restaurant last year. 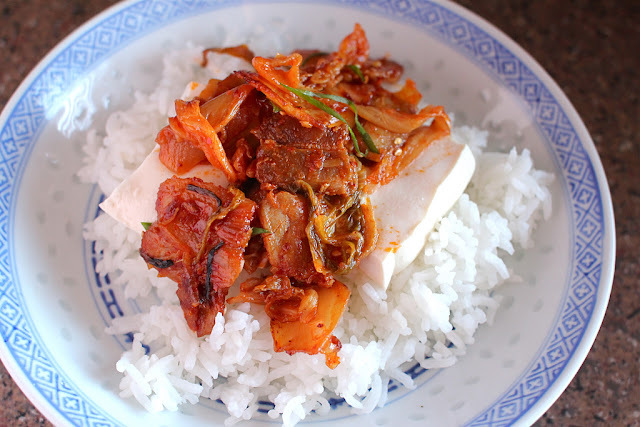 I love the combination of kimchi with pork belly, and the textural contrast of the slices of meat and chunks of kimchi against the silken tofu which absorbs all the flavours of the other ingredients. To replicate this dish at home I looked up a few recipes and my version is largely based on Andrea Nguyen’s recipe from her cookbook Asian Tofu but I also added additional seasonings including gochujang (Korean hot bean paste) and soy sauce to adapt the flavour to my desired taste. A lot of people who cook harp on about making things from scratch all the time and I’m definitely someone who tries to make a lot of food from scratch and for me, a lot of it is about understanding how food comes together and being in control of the flavours and end results. I find the whole process of cooking fascinating. But I don’t make everything from scratch, sometimes it’s not practical or I just need a little of something so I allow myself a few convenient store bought goods. I didn’t make the kimchi myself. I haven’t made kimchi from scratch yet. I know that it’s a relatively simple process but you need to give it some time to allow it to ferment and develop its unique flavour. Kimchi is also one of those things where if you go through the process of making it, you end up making a large quantity of it, at least a kilo if you take into account that you use a whole cabbage. I am unlikely to go through that much kimchi on my own. Similar to if you make jam, you’re not just going to end up with one jar but at least half a dozen. 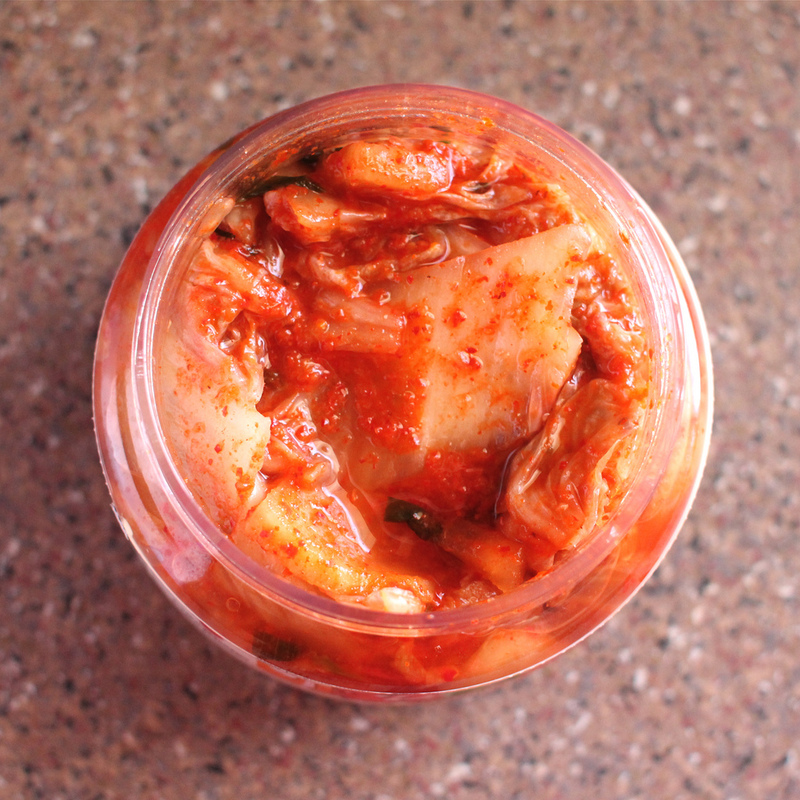 It’s easier for me to buy a small tub of kimchi from my local Asian supermarket whenever I need a fix. Are there any food items that you buy rather than make because you just need a small amount of it? What I found interesting about Andrea Nguyen’s recipe was that she adjusted the flavour of mature kimchi by adding in some sugar and red chilli powder. This makes sense because as kimchi ages, overtime its flavour profile will change through fermentation as it ripens and it becomes more sour. So you can freshen up the flavour of the kimchi by adding in a little sugar to temper it’s sourness and some chilli powder to turn up the heat if desired. So I discovered that I could muck around with the chemistry of kimchi! When I have eaten kimchi it’s usually on its own but it’s often used in stir fries. This was the first time that I have used kimchi in a stir fry and it’s definitely something I will be doing more often. 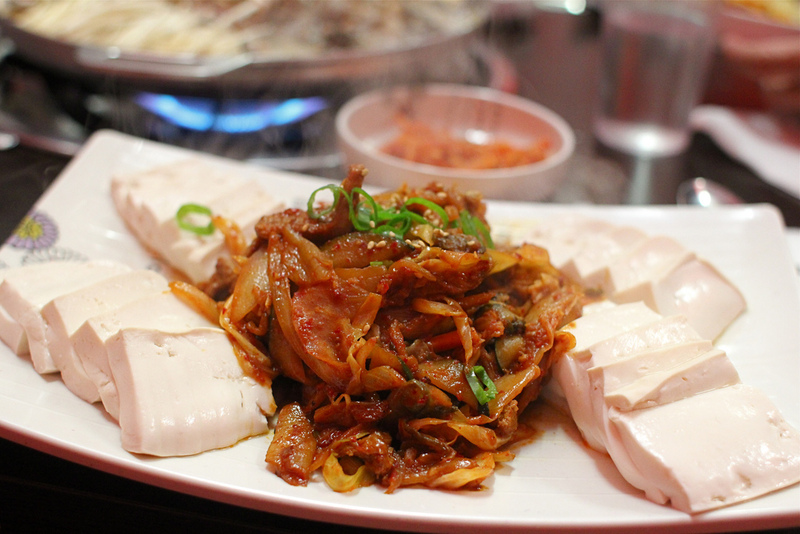 Notes: The pork needs to be sliced thinly so that it absorbs the flavour of the kimchi better. To make slicing easier, out the pork in the freezer until it is slightly frozen/firmer and use a very sharp knife. In a saucepan large enough to fit the tofu, fill with 4-5cm of water and a pinch of salt, and bring to boil. Then turn off the heat and place the tofu in the pan of water to warm through while you make stir fry. 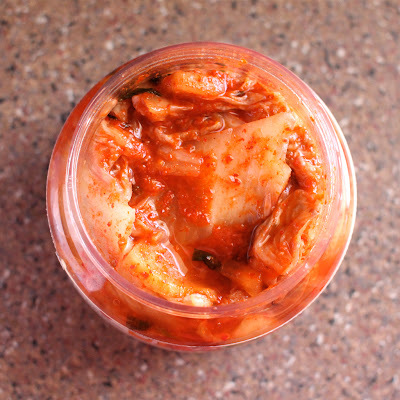 If necessary, cut the kimchi into 1-1 ½ inch pieces, then transfer to a bowl. Season the kimchi with some sugar and red chilli powder to offset its tartness and adjust the heat to desired taste so that it is pleasantly sour-sweet with a light spicy kick. 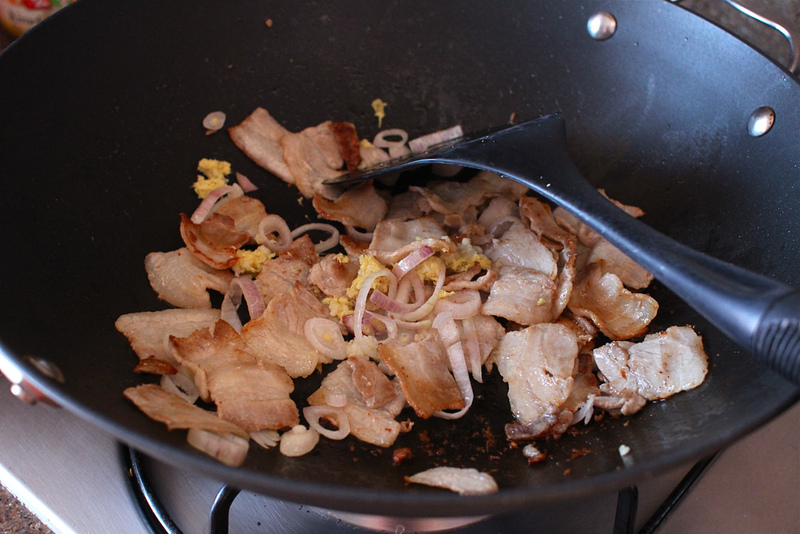 Heat wok with 1 tablespoon of vegetable oil and add in slices of pork. Stir fry the pork pieces until they are slightly brown. Add in the shallots, garlic and ginger and stir fry for 30-60 seconds. Then add in the seasoned kimchi. Cook, stirring frequently for about 3-4 minutes to allow the pork to absorb the flavours of the kimchi (test by tasting the pork). Then add in some gochujang, light soy sauce and sugar to desired taste, stir fry everything together. Turn off the heat and stir in sesame oil. Pour off the water from tofu, slice into 1-1.5 cm thick blocks and arrange on a plate. Transfer the kimchi and pork onto the plate and garnish with toasted sesame seeds and spring onion. Thanks Lorraine :) Kimchi is an acquired taste, it took me some time to fully appreciate it too. I went to a nose to tail cooking class over the weekend and this dish was nearly the same as what the chef prepared. I loved it! I too took a long time to sidle up to kimchi. We’ve recently launched the website Everyrecipe.com.au. It’s a search engine that aims to gather all the best recipes from Australian websites and blogs. We’ve noticed that you have a lot of great looking recipes on your blog that we would love to feature on our site. To read more about how it all works and to sign up with your blog, please visit: http://everyrecipe.com.au or send us an email on info@everyrecipe.com.au. We look forward to hearing from you! pork belly is my favourite ingredient/food and kimchi with it sounds amazing! mmmmm I heart korean food so much! it is absolutely one of my fav cuisines and kimchee is one of the things I can simply never get sick of. Wow that looks like such a vibrant and delicious dish. I love kimchee and would love to try this.